We are available with aluminum pull handles that are in high demand in the national as well as international arena. These aluminum pull handles are rigorously tested for quality, durability and flawlessness ensuring the best assortment is delivered to the market. - Available in different finishes like EB, Satin, Chrome etc. Finish: Nickel Silver,Chrome Silver,Brass Antique,Brass Antique Matte,Satin Silver,Satin Silver Matte. Owing to our in-depth knowledge of this domain, we are specialized in providing Aluminium Door Handle. We are manufacturer, supplier and exporter of Door Handle Aluminium. 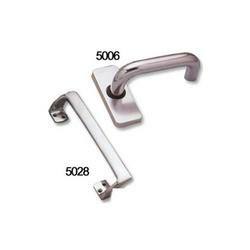 We are engaged in offering superior quality range of aluminum handles in all sizes and in different designs. 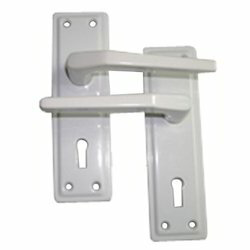 Our range of these handles finds wide application in industries. In addition, we also customize these are made as per the specific requirements of the clients. These door handle on square rose offered by us are an attractive addition for each doors. Sturdily designed in stylish look, these door handle on square rose cast a spell in the milieu. Trusted for their durability and beauty, these door handle on square rose are available in a myriad of magnificent designs, finishes and sizes. Aluminium Straight Door Pull Handle.